You will be given a reference e-book to read which has 398 pages And the test will be based on that e-book , you can take final test within 1 year of purchase. If you are one of the hundreds of people who want to take up IT certification courses with an aim of understanding network and different IT systems and help various organizations protect all the sensitive data stored in their computers, networks and IT infrastructure, then the firewall certification program from Brainmeasures is the most suitable course for you. The firewall course which you can take from Brainmeasures, an online certification company known for its good reputation and its ability to provide high quality certification programs, focuses on satisfying the increasing need for highly knowledgeable and expert network professionals who are capable of implementing the best network security solutions. You can expect this online certification course to provide you with the most comprehensive firewall training and this is a huge help in your attempt to understand all the procedures involved in developing secure solutions for different IT and network infrastructure and making sure that these solutions deliver the highest level of network security access. 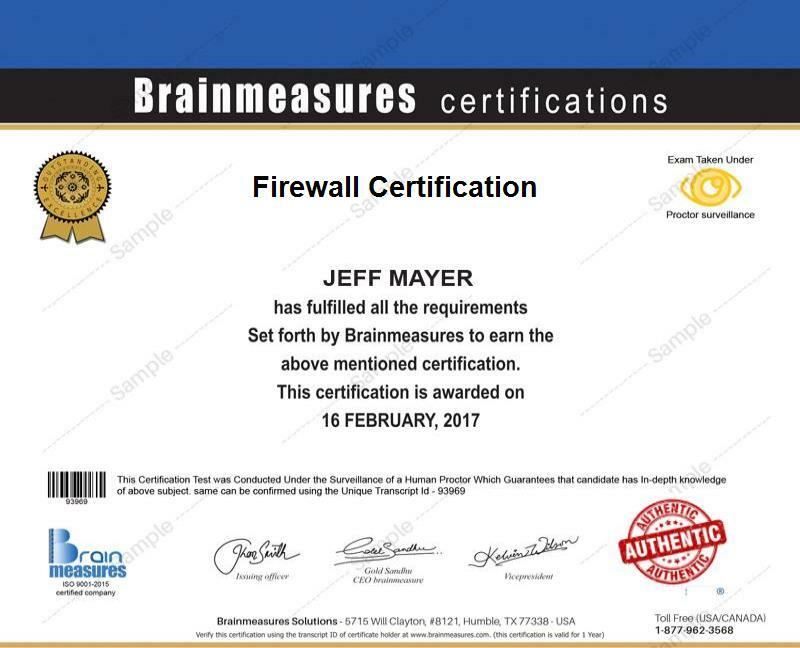 Due to the comprehensiveness of the network security training that you can get from the firewall certification course offered by Brainmeasures, you will never find it hard to execute all your duties and responsibilities once you receive your certificate in the field and work as a firewall professional. Anyone who performs most of their daily tasks with the help of computers, networks and the internet can be greatly benefited by a firewall certification program. It is primarily designed for network security technicians and specialists, network security engineers and other professionals who are responsible in managing the firewalls of networks and the security of data stored in various programs, data centers and applications within the network. The firewall certification program is also suitable for IT managers, network administrators and network security professionals who are tasked in installing, supporting, configuring and troubleshooting security programs and solutions. Holding a firewall certification is a huge help in your attempt to make a significant difference in the amount of salary that you receive on an annual basis. As a firewall expert, you can expect to earn big since many business organizations are now running based on networks and more advanced IT infrastructure. Providing your expert knowledge and skills in setting up a firewall and securing the network of business organizations will allow you to earn around $77,000 to $101,000 per year.